Play it Loud! The Rebellious History of Music by Sara Gilbert. A Pop Culture Revolutions Book. Review: POW! WHAAM! Ring ring! These are the sounds of music. Intricate, beautiful, intriguing music. Music has been a huge impact on the world. It has made marks in history throughout society, government, and other worldly issues. Play It Loud! The Rebellious History of Music by Sara Gilbert goes into depth about how much music has done for the world. It talks about many different artists and groups of people who have made history and music by speaking or singing for what they believe in publicly. People like Elvis Presley and Joan Baez did their own thing, no matter if people agreed with them or not. Music did so much for everyone in the world and let so many people let go of their emotions and feelings and this book made that very clear. Play It Loud! is a very interesting, great, and informative book. It gives accurate accounts that made me think "Wow, that's so true! I can see how much music did for people!" It let me realize that music really is a wonderful thing with so many prospects. The fact that there are so many examples of artists who for example spoke out against wars or just doing what you want and ignoring the nay-sayers was amazing, because I knew then that not just a couple of people are using music's power to send an important message, many were joining in on the movement. In the book, each section telling of a certain artist or genre transitioned smoothly into the next because many had a similar subject or message. Each chapter could be related to the previous or next and was definitely readable. Not to mention how relatable the book was. Play It Loud! Features artists who went through tough times in their childhood and because of the high poverty level in bigger cities in modern times, many teenagers could probably relate to the artists. The fact that I understood and related to almost everything music has done that was mentioned in the book makes me believe even further that the book will be interesting to many. Next, on top of the fact that such useful, detailed information is included in this fabulous book, it's very interesting. Most preteens-teens are very interested in music, lots of kids spend most of their free time on their iPods and listening to the radio, and music is a very popular thing in recent times. Since so many kids enjoy music, many would be interested in learning more about how it has developed and what it has done for the world. Altogether, Play it Loud! is a fabulous book that is very interesting, descriptive, and relatable! It drew me in and kept my attention! I'm very glad that I had the chance to read this great non-fiction book and would definitely read it again! We would like to thank Media Masters Publicity for providing a copy of Play it Loud! The Rebellious History of Music for this review. 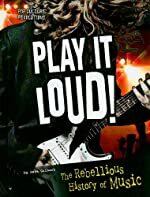 Have you read Play it Loud! The Rebellious History of Music? How would you rate it?